I have been attracted to scrap quilts ever since I was a teenager in the 1970s. In fact, one of my high school art projects was an attempt at an ambitious scrap art quilt. I had no idea what I was doing and the project was never completed. Amazingly enough, I got a decent grade from my art teacher because he appreciated the vision. I still have the incomplete pieces. Fast forward over 30 years later and I fell in love all over again with vintage scrap quilts when I reworked a tattered quilt top for my mother . A love affair started as I took my grandmother’s battered quilt top and reworked it for my mother to use as a lap quilt. I discovered that it wasn’t just vintage quilts that I wanted to work with, it was the incomplete, unfinished or damaged quilt pieces that drew my attention. Something appealed to me very deeply about taking an unfinished or damaged scrap quilt piece from years past and giving it new life. These pieces serve as a metaphor to me that life is a journey… always evolving… with scars and wounds… never truly complete… but ever beautiful. These pieces remind me that life itself is passed on from generation to generation, and that we take whatever is given to us from the past and work with it to define our present and prepare for our future. And so I collect orphaned and practice quilt blocks. I collect partial and whole quilt tops that never got completed into a whole quilt by the original artist. I collect quilt pieces with holes and dirt, damage and stains from years and years of use. I collect partial quilt blocks that got abandoned when life… or priorities… or disinterest… took the quilter away from the original project. I may admire the beauty and skill in a completed vintage quilt, but I embrace and adore the incomplete, unfinished, or damaged work started by others before me. And I rework the pieces. In the past I have turned pieces into pillows, table toppers and lap quilts. And while I still do these occasionally, my current fascination is to take these old pieces and fuse them onto canvas to create wall art. Sometimes I isolate the original quilt blocks in these new creations of wall art. Other times I cut the original piece up and reassemble it in a new pattern. In every case, I am struck by the beauty and power of color or pattern that the original quilter decided to work with. And I feel blessed to have a chance to connect with the past while completing a project in the present. My name is Ruth Warren. I am a reuse artist who creates art from discarded materials. My subject matter is inspired by the beauty and whimsy of the natural world that surrounds me. 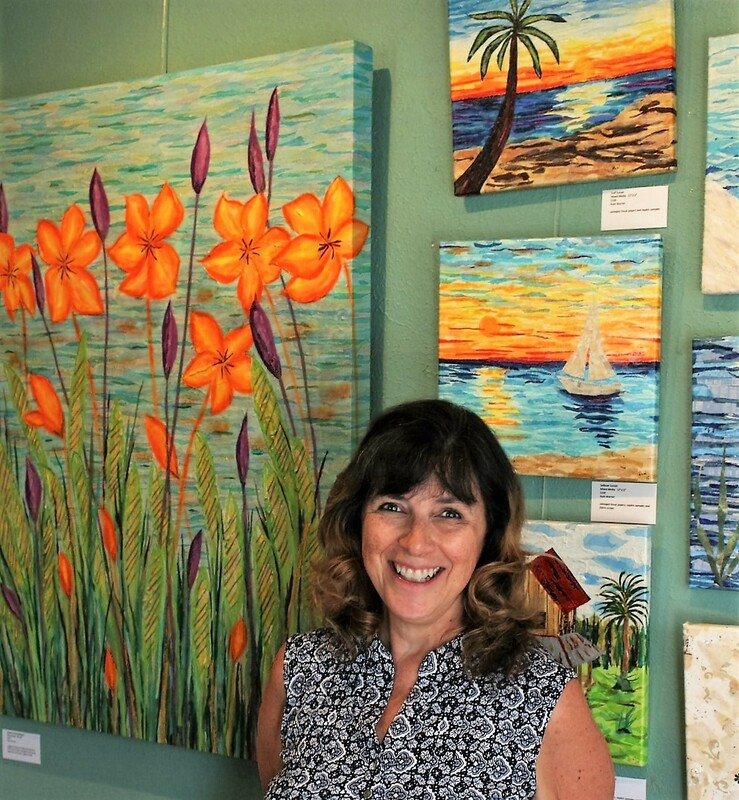 I live in Bradenton, Florida, home of the Village of the Arts! Find out more about my reuse art on my About page.